Treatment for cancer may mean you have to make many visits to hospital to see your oncologist. 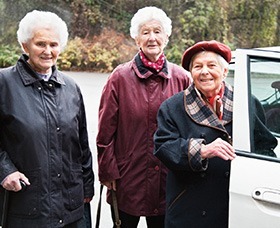 If you can’t travel independently to cancer treatment appointments for health, financial or personal reasons, the Cancer Focus NI Driving Service can provide you with door to door transport from your home. This patient support service currently operates in the South Eastern and Belfast Health Trust and Newtownabbey areas. You have to be referred for our service by a medical professional or social worker, so if you’re having problems please let them know so they can discuss your options. If you want to know more about this or any of our patient support services, email care@cancerfocusni.org or call us on 028 9066 3281. We can’t provide this service without volunteers. Click here if you’d like to find out more about volunteering.